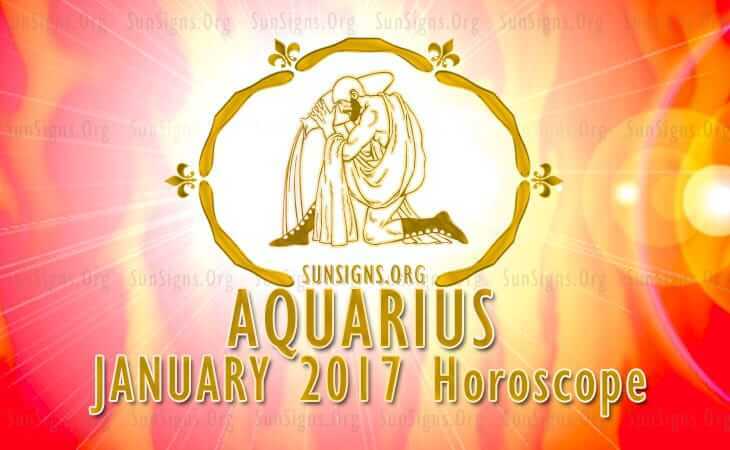 January 2017 Aquarius Monthly Horoscope foretells that major changes will be seen in your life. You will shift focus from career orientation to family and emotional aspects of life. More than 70 per cent of the planets are in the Eastern half of the natal chart for the Aquarians in January 2017. It is the time to take the bull by the horns and to forge ahead in life as per your wishes. There is no need to be flexible or adapt to the external situations. However you should be compatible with people in the execution of your goals. In case you find the attitude of other people to be obstructing then go by your gut feeling and move forward. The astrology 2017 predictions forecast that this is a good month for making an overall assessment of your life. The Aquarius personality can make future plans by correcting their past mistakes and dreaming about a new and bright future. You will have the guidance of psychic forces in this endeavor. You can seek the help of a spiritual leader to reach a higher level of emotional comfort. Your intuitive faculties will be excellent and will guide you with regards to your future in January 2017. The Aquarius horoscope for January 2017 warns you to try to finish your career objectives during the first half of the month. Use the second half to visualize and plan future strategies for business development. Aquarius, you will be offered with plenty of financial opportunities during the month of January 2017. Your job is to make the right financial investment choice. Monetary success will be greater after the mid month. You may invest in personal luxury items. Get your 2017 Rashifal. Romance is excellent in January 2017 for the Aquarius sun sign. But it may be invisible till nearly the end of the month. If you are single, you will find your partner after that and you will have a harmonious relationship. Aquarius compatibility in married couples will be excellent. You will have a peaceful marital environment. Pregnancy related news can also be expected after the 2017 Mercury retrograde dates. The Aquarius monthly forecasts for January 2017 predict that your health will be fabulous during the month. You can improve your fitness by physical training and by attending to your emotional requirements. Sick people will find solutions to their health problems during the month and can expect permanent cures using simple natural home remedies. The Aquarius 2017 January horoscope forecasts a busy social life with excellent personal and professional relations.